Mortadella is produced as large sausages, which are then cut into thin slices. Mortadella di Bologna is an Italian kind of sausage. It is made of ground pork meat. Salt, pepper, sugar as well as small cubes of pork fat are added. It is then made into big sausages. It is then cooked in special ovens at 90°C (194° Fahrenheit). Some kinds of Mortadella have other spices in them. 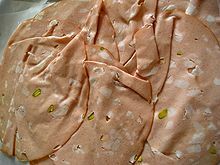 As a Protected Geographical Status food, Mortadella di Bologna must come from the Bologna province. 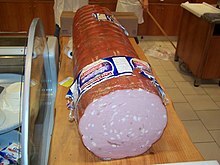 Mortadella is also produced and consumed in other countries. It is very popular in Spain, and Portugal. Many Italians emigrated to South America in the early 20th cenury. For this reason, Mortadella is also very popular in Argentina, Bolivia, Peru, Brazil, Ecuador, Chile, Colombia, Uruguay and Venezuela. In these countries it is spelled ''mortadela'', and its recipe is quite similar to the traditional Italian, with additional pepper grains. This page was last changed on 10 June 2018, at 21:19.